Vegetarians attending your barbecue? Serve this main dish recipe of colorful, appetizing grilled vegetables. Bring a small amount of water to boiling in a large saucepan; add asparagus and carrots. Return to boiling; reduce heat to medium-low. Cook, covered, for 3 minutes. Drain well. Set aside. Lightly coat a grilling tray or vegetable grilling basket with olive oil or nonstick cooking spray. Coarsely chop all vegetables except tomatoes. 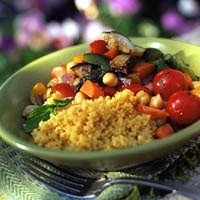 Combine chopped vegetables and tomatoes, garbanzo beans, and 2 tablespoon soil in a large skillet, tossing well to mix. Cover and cook over medium-low heat for about 12 minutes or until heated through, stirring occasionally. Meanwhile, bring broth and chili paste to boiling in a medium saucepan. Stir in couscous and turmeric; cover and remove from heat. Let stand 5 minutes or until liquid is absorbed. Fluff couscous with fork. Place on a serving platter, and top with vegetable mixture. Garnish with mint. Makes 4 to 6 main-dish servings. 6 vegetable, 1-1/2 starch, 1 fat. Calories 321, Total Fat 8 g, Saturated Fat 1 g, Sodium 514 mg, Carbohydrate 53 g, Fiber 13 g, Protein 11 g. Daily Values: Vitamin A 69%, Vitamin C 74%, Calcium 5%, Iron 16%. This entry was posted on 6:26 AM and is filed under Grilling . You can follow any responses to this entry through the RSS 2.0 feed. You can leave a response, or trackback from your own site.